Seriously, you’re gonna wanna blow this picture up real big and take a good look—Ernest Cline’s love of sneaking all sorts of references to different brands and companies is already looking to be alive and well in Steven Spielberg’s Ready Player One adaptation. 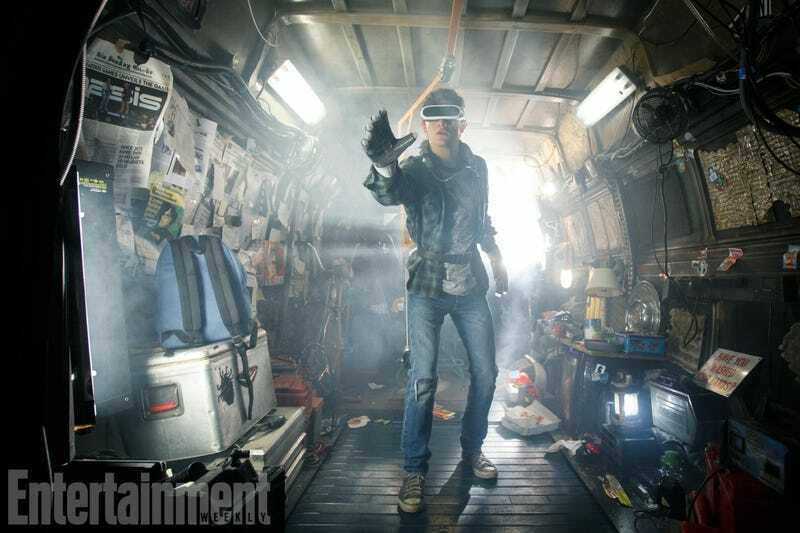 Released through Entertainment Weekly this morning, the shot comes from early in the film, and sees Wade Watts (Tye Sheridan) in his junkyard hideout hooked up into the video game VR world of the OASIS, escaping from the drudgery of living in a dinky, towered trailer with his aunt in the grim future of 2045. While there’s some changes—most notably the fact Wade isn’t an overweight teen whose only exercise in the poverty-ridden “stacks” he lives in is using a bike to charge the batteries for his OASIS headset, perhaps hinting that at least some aspects of the novel’s wish-fulfillment in Wade’s journey might be trimmed from the film—what’s readily apparent is the fact that the world of pop culture references and brand allusions is alive and well in Spielberg’s version of the movie... even if most of the references to his own films that were in Cline’s novel won’t be. You can see the picture in all its high-res glory here, and there’s so much in it, from tattered M&M’s wrappers and Carl’s Jr. bags, to Garbage Pail Kids stickers and a He-Man and the Masters of the Universe lunchbox. It’s a great first look at the film, even if it leaves a lot of questions unanswered, like just how Spielberg is going to bring the virtual world of the OASIS to life. Ready Player One is set to hit theaters in March 2018.